One of the most common indoor pollutants is cigarette smoke. Removing the fetid cigarette smoke smell is difficult because the smoke permeates and sticks to leather furniture, floors, and everything in a smoker’s household. If you are looking for methods on how to get smoke smell out of leather, you are in the right place. 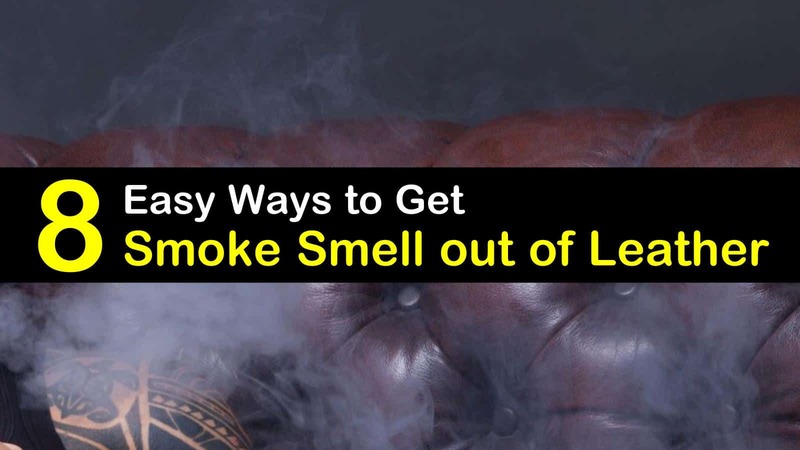 This article discusses how to get smoke smell out of leather, the DIY way, without needing to spray commercial air fresheners like Febreze or other scented sprays. There are several ways to get rid of the smoke odor, and some of the methods are time-consuming but, with patience and effort, it will yield positive results. You can try any of the following or check all to know which works best to banish the bad smell on a leather car seat or eliminate tar residue in the house from your leather furniture. Vinegar is a conventional household liquid that can disinfect and clean at the same time. It can also work wonders in removing cigarette smell. Gather ingredients and mix water and vinegar in a bowl. Using a soft fabric, rub the mixture of water and vinegar into the leather surface without saturating the leather. Allow the surface to dry. That is how to get the smoke smell out of leather using vinegar. If you have a small, opened box of baking soda in your kitchen cabinet, take it out and use it as an odor remover. Grab a plastic bag like a Ziploc and pour a handful of baking soda into it. You can now use it to remove the smell of cigarette smoke in your leather purse. Just place the opened Ziploc inside the bag and leave it that way until the cigarette smell fades. Never pour the baking soda directly on the surface of the leather because it can change the leather’s acidity level and damage it. If you are not a fan of vinegar as a cleaning solution due to its odor, you can still remove cigarette smell from leather by using a rubbing alcohol and water mixture. Mix rubbing alcohol and water in a small bowl. Apply the mixture to the leather using a soft material. Let it dry and repeat the application of the solution as necessary. Dish soap is the mother of all greasy and foul-smelling grime removers. Aside from that, dishwashing liquids can effectively clean and remove unwanted smoke smells. Pour warm water in a large spray bottle and add dishwashing liquid. Put the cover and shake well. To use, spray the solution in your leather handbag, sofa, leather jacket, or purse. Using a cloth or soft sponge, wipe down and remove any dirt or buildup that may be causing the foul smell. Keep the excess DIY cleaner in a cabinet. You can use the remaining solution to wash canvas shoes and for other cleaning purposes. Dryer sheets work as an odor absorber for clothing. If you happen to have a box of them, repurpose some to absorb foul odors inside the house by placing several dryer sheets in different locations. You can put one in a closet, another in the kitchen, or near the shoe rack. If you have a smelly bag that reeks of cigarette smell, throw a dryer sheet inside. For larger leather items such as couches, insert the dryer sheets between cushions. You can also do the same to remove the smell on a leather car seat. The strong scent of coffee makes it a great natural odor absorber. Similar to baking soda, it works wonders for absorbing foul smells in the air. To utilize your coffee grounds as a deodorizer, grab an old nylon stocking and fill it up with coffee grounds. Place it in an area where the cigarette smell is most potent and let it sit for a couple of hours until the smell is gone. The sun’s benefits are not limited to providing light and warmth. Taking out a leather sofa under direct sunlight and in the open fresh air will do some good leather cleaning. The wind will blow away some of the nasty smell, and the sun will kill bacteria on the leather. Keep in mind, however, to not keep the leather couch under the sun for extended periods to avoid damage. Leather materials are naturally infused with oils that provide its durability and robust texture. Altering its oil content and upsetting its balance can adversely affect its look and cause damage. To restore the leather’s shine and finish, you do not have to go to a hardware store and get a leather conditioner. The key to maintaining the condition of leather and removing its foul smell is to replenish the leather’s natural oil periodically. Get a soft cloth, add few drops of natural oil such as flaxseed oil or coconut oil on the rag and wipe the leather furniture completely. If you do not have flaxseed or coconut oil, use olive oil leather conditioner or any natural oil leather conditioners. Natural oils come from organic substances such as flowers, leaves, stems, and roots of a plant. Although it is commonly associated with the word oil, natural oils are not oily at all. The best natural or essential oils are lavender, lemon, mint, and eucalyptus. These oils can work as a cigarette smoke remover. You might consider using saddle soap to clean your leather bags, jackets, and furniture. However, this solution is precisely what it sounds like, a bar of soap for cleaning saddles. While some suggest trying saddle soap, we recommend avoiding this product. It is too alkaline for non-saddle leather and may only cause damage. Families benefit from home environments that have enough ventilation and sufficient fresh air. Indoor pollutants should regularly be removed to ensure a place that is considerate and supportive of allergy sufferers. Many studies have also linked cigarette odor to lung cancer, which is the first disease that is connected to thirdhand smoking —the residual or leftover cigarette chemicals that get stuck on clothing and surfaces after the smoke clears. To avoid increasing the risk of cancer, you can remove smoke smell by trying the tips and tricks we discussed (..). 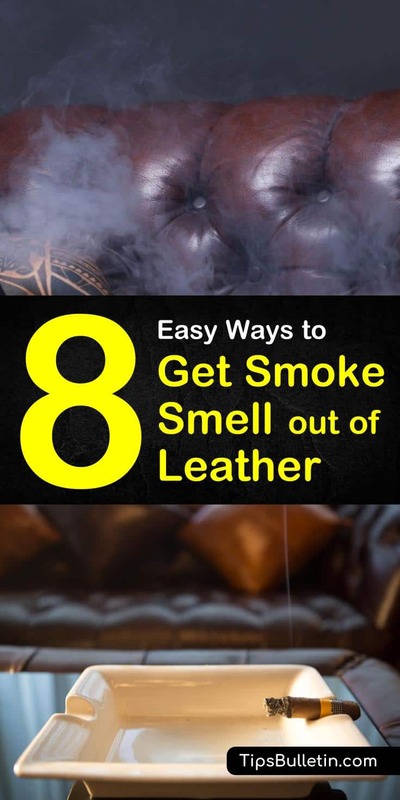 If you found these smoke smell remover recipes useful, please share these tips on how to get the smoke smell out of leather with your friends on Pinterest and Facebook. Save money by using household products to eliminate the odor of tobacco smell!